Below is a full list of Keswick Restaurants in England with Websites, Phone Numbers, Images and links to Maps and Reviews. Situated on the Main Street at the Market Square. A traditional Lakes pub serving good food with a fine selection of ales. Tel: 01768 772 663. Situated on the Main Street just north of the Market Square. A family friendly American themed diner serving traditional American and Tex Mex styled food.. Tel: 01768 744 351. Situated on the Main Street at the Market Square. The famous Bryson's Tea Room has full waitress service, is fully air conditioned, serves hot and continental breakfasts, lunches, light meals and afternoon teas. Tel: 01768 772 257. Situated about 300 yards southwest of the Market Square on Lake Road. A stylish wine bar serving good wine, coffee, continental style lunches, and tapas and Italian-style flatbreads each day between 5.30pm and 8.30pm. Tel: 01768 780 863. Situated about 700 yards north of the Market Square on Luptons Court. A teashop which serves homemade food. The shop is open seven days a week from 9.30am to 5pm. Tel: 01768 773 075. Situated on Lake Road at the Market Square. Old traditional pub that offers beers, lagers, real ales and home cooked pub food. Tel: 01768 773 463. Situated about 100 yards southwest of the Market Square on Lake Road. Stylish and contemporary cafe that offers a selection of lite-bites, a variety of cakes and world class coffee. Tel: 01768 772 443. Situated on the Main Street at the Market Square. 200 year old building with a warm and welcoming atmosphere. A wide variety of foods available, including a vegetarian option. Tel: 01768 744 965. 50 yards northeast of the Market Square on Bell Close. A contemporary bar featuring a wood burning stove and serving a range of coffees, cakes, local ales, light lunches, and bar meals. Tel: 0800 840 1247. On Lake Road at the Market Square. A small pub with quirky decor and and a great place to eat before going out and exploring Keswick. Tel: 01768 772 404. Situated on Station Street at the Market Square. Contemporary bistro that serves locally sourced and freshly cooked food as well as a selection of beers and lagers. Tel: 01768 774 080. Situated on the Main Street at the Market Square. A cosy cafe with a selection of the best home baked cakes and hot dishes. Open 7 days. Tel: 01768 775 050. Situated about 350 yards south of the Market Square on Lake Road. Contemporary restaurant that is open 6 nights a weeks and offers a mouthwater menu and daily specials. Tel: 01768 772 666. Situated on the Main Street at the Market Square. Excellent pub that serves good quality food and beer. Tel: 01768 772 682. Situated 100 yards north of the Market Square on Packhorse Court. Traditional old fashioned pub offering a wide selection of home made food, wines and ales. Tel: 01768 771 148. Situated on the north side of the Market Square on Main Street. Fresh sandwiches, paninis latte, cappucino and more. Situated on Bank Street at the Market Square. Fish and chip shop offering a wide selection of foods that are prepared using only the finest ingredients. Tel: 01768 772 609. Situated about 250 yards from the Market Square on Lake Road. A traditional pub providing up to seven real ales and good food. Tel: 01768 744 927. Situated on the Main Street at the Market Square. 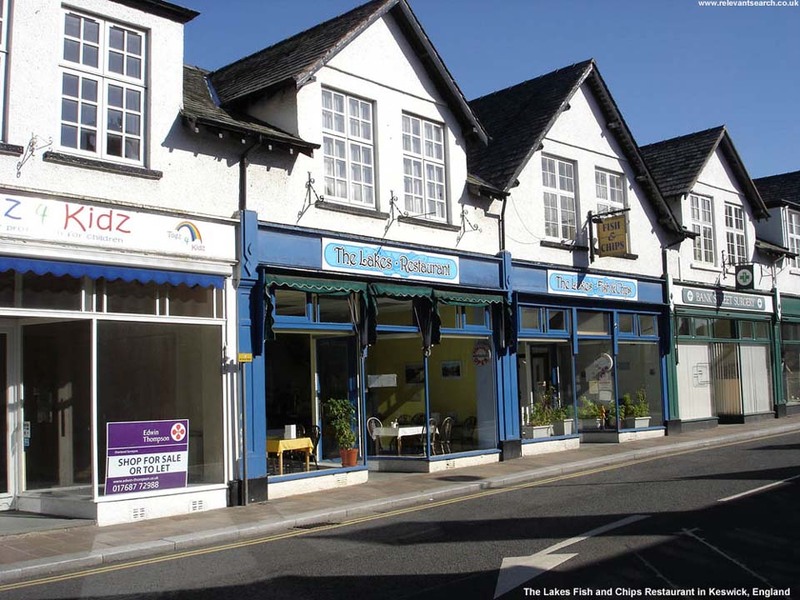 A teashop in the centre of Keswick that serves great afternoon tea and home made cakes, and is also licensed to sell wine. Tel: 01768 774 399. Situated on the Main Street about 150 yards from the Market Square. Chinese Restaurant that offers a wide selection of excellent food. Tel: 01768 773 165. Situated on Museum Square at the Market Square. Chinese Restaurant with good food, excellent service and a great atmosphere. Open 7 days a week. Tel: 01768 771 364. Situated on the Main Street about 200 yards from the Market Square. Indian Restaurant with fantastic food, good atmosphere and great service. Tel: 01768 780 005. Situated about 500 yards east of the Market Square on Station Street. A family run restaurant that specialises in a variety of Italian dishes to suit everyone. Tel: 01768 775 575. Situated on the Main Street at the Market Square. A modern and relaxed restaurant, and a great place to eat if you're looking for homemade stone baked pizzas, pastas and desserts. Tel: 01768 772 083. Situated on St John Street at Market Square. Italian Restaurant that serves delicious and creatively designed pizzas that are freshly made to order. Tel: 01768 773 523. Situated on the Main Street at the Market Square. Warm and friendly restaurant that serves freshly cooked mouth watering Thai dishes. Tel: 01768 771 444.